emma lamb: making everyday beautiful : hello Septmber! 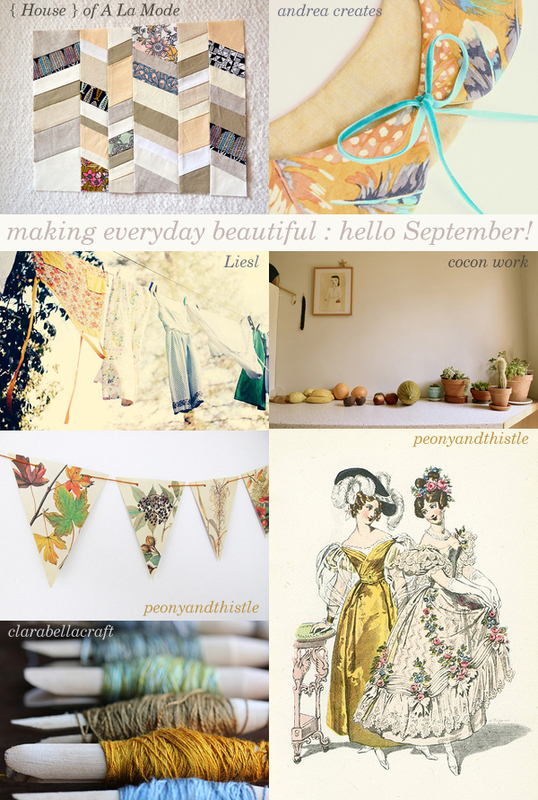 making everyday beautiful : hello Septmber! Good morning! Hello and welcome September!!! Yes it is September already, wowee! And after a lovely long, lazy summer break I'm feeling excited about revving up my creative juices again, how about you lovelies? Maybe you've already been up to some serious crafting goodness while I've been away? I know there has been much wonderfully beautiful activity to catch up with in our fabulous Flickr group 'making everyday beautiful' - over 100 gorgeous images to add to the pool, thank you! It's been so tough to pick my favourites for today's post summer collection, but I though these were quite fitting to welcome a new month and celebrate a sense of transition with an exciting creative season just around the corner... autumn is coming, yay! Lovely tones. :) Although I'm a summer girl at heart, my favourite colours are definitely autmnal! Thanks so much for including us with these lovelies! Good to have you back!!! absolutely lovely subdued colors of a fabulous fall ... love Andrea Creates!